Before the Saturday Club came into existence in 1875, the members of European communities depend for their dancing on the fornightly assembly balls at the Town Hall, or private dance parties. The Town Hall also used to hold concerts mainly given by amateurs, occasionally assisted by professionals, but there were no professional theatricals. The demand for this kind of entertainment was filled by the Calcutta Amateur Theatrical Society (CATS), which used to give about six productions during the cold weather season. In their amateur performances there were no actresses. All the ladies’ parts were taken by young boys. At first for their performances, CATS were given on the ground floor of where the Saturday Club now is, but after a time this was not found satisfactory. Then one of its most enthusiastic members, “Jimmy” Brown, who was a partner in a firm of jewelers, carried through a scheme for building CATS’ own theatre – the St James Theatre. 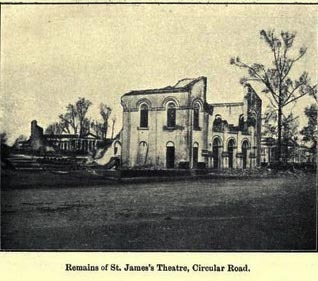 The St James Theatre was erected, presumably around 1860, in Circular Road at the corner of Hungerford Street by Jimmy Brown, who at a cost of Rs. 30,000. Here CATS carried on until in the great cyclone of 1864 the roof was blown off and the building seriously damaged. Montague Massey in his Recollections wrote the end story after the St James Theatre was destroyed. “We had, therefore, to move again, and went to where Peliti’s is now, which was then occupied as a shop. After one season there, we were temporarily located in a theatre built in the old Tivoli Gardens, opposite La Martinière. The “CATS,” as we used to be designated, was a very old institution, and had been in existence some time before I joined up. They were very ably and energetically managed by Mr. G.H. Cable, assisted by Mrs. Cable, the father and mother of the present Sir Ernest Cable. They were affectionately and familiarly known among us all as the “Old Party and the Mem Sahib.” He used to cast all the characters and coach us up in our parts, attend rehearsals, and on the nights of the performance was always on the spot to give us confidence and encouragement when we went on the stage, while Mrs. Cable was invaluable, more particularly to the “ladies” of the company. She chose the material for the gowns, designed the style and cut, tried them on, and saw that we were properly and immaculately turned out to the smallest detail”. This entry was posted in Establishments, Play Houses, Ways of Life and tagged Calcutta Amateur Theatrical Society, CATS, Circular Road, Jimmy Brown, old calcutta, st James Theatre, town hall.